I keep making Tarte Tatin since I came back from France. Last time I made a pretty innocent one, with not much sugar and butter. This time I wanted it to be rich and really pretty. The idea was to make a thick apple layer. Like the one I saw in Berthillon Paris cafe. The thing pictured in my memory when I visited the cafe with my Paris friend. Berthillon seems to be the most famous Paris ice-cream cafe. It has many outlets, which are surprisingly located one almost next to the other. When I first came to Ile Saint-Louis, the first thing I notices was that almost all the people in the street were eating fruit sorbets from slim waffle cones. Then I bumped into Berthillon street stand. It offered many different fruit sorbets. I got a mango scoop - ah! - it was the best fruit sorbet I ever tried. I kept walking and found another Berthillon outlet, which was a cafe with tables, waiters and a long line outside. Next time we came together to have fun standing in that line. When we entered I noticed the Tarte Tatin in their vitrine. It was som 8-10 cm thick, I'm not kidding. That was all apples on a thin pastry layer. I didn't happen to try it though. We immediately were taken up by the ice-cream menu. No surprise my Tatin didn't come out a twin of the Berthillon one. I'm still happy though as I got a gorgeous layer of soft and melting apples saturated with dark buttery caramel on a light and thin pastry. This Tatin also was much more beautiful than the previous one. So here is the recipe. Peel and core the apples. Slice them into segments around 1.5 cm thick. In a small heavy base pan combine the sugar with some water (enough to get the sugar wet). Set the pan over high heat, bring to boil. Boil until the syrup thickens and turns golden. Cook a bit more, to get dark brown color. When done, pour the caramel into a round cake baking dish (I'm using a 22 cm one). Slice the butter and place it on the caramel layer. 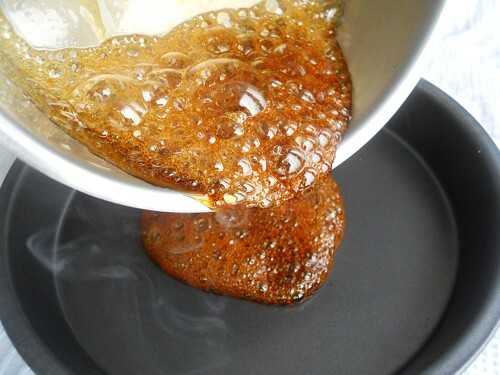 As the caramel is still hot, the butter will melt and spread into a thin layer. Place the first layer of apples on top of the butter to get the proper "Tatin" look. Add the rest of apples, packing them tightly. The apple layer might be taller than the baking dish side. Don't worry, apples cook down dramatically. Cover the dish with foil and stick into 200°C oven. Bake for 20 minutes, take out. Without removing the foil press the apples down, to make them fit the dish. Return to the oven for another 20 minutes. Take the apples out and remove the foil. Unfreeze the puff pastry if you bought it frozen. Roll it into a circle about 2-3 mm thick. Cover the apples with puff pastry. Fork the pastry a bit and and stick the dish back into the oven for another 15-20 minutes until the pastry turns golden brown. Take the Tatin out, let it rest for 15-20 minutes. If you want it picture perfect, then you want to let it rest longer. Maybe even cool completely. 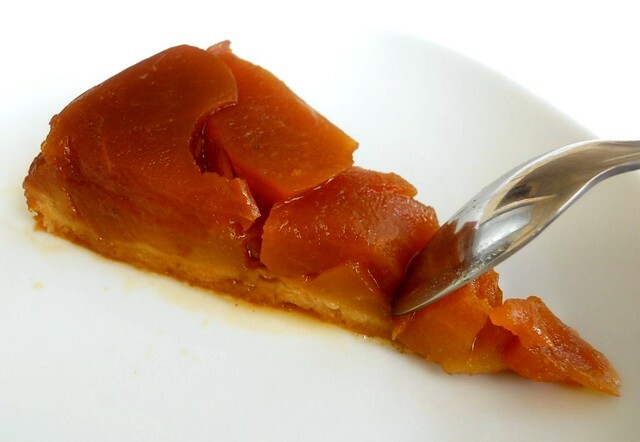 Before serving cover the baking dish with the serving plate and flip the tatin over. Normally it comes out with no problems. If some of the apples stick to the baking dish, just move them with a knife. Cut and serve. I prefer it warm with a schoop of vanilla ice-cream. However it is also great cold and just on its own. Wow this looks fantastic! Pineapple is my favorite :) Glad to be your newest follower! I'm making this now - so far so good! Nice simple recipe which I'm sure is delicious!! I was looking for a recipe as I enjoyed this dessert when in Paris recently. Thanks! That's great! Thanks for letting know :) enjoy it a lot! It was a complete success! My wife and I have finished it off this evening with vanilla icecream. What kind of apples do you use? I will try Golden Delicious next time. I also used raw sugar but will try white sugar next time. My wife did notice some small blobs of butter so perhaps I could have stirred the butter into the caramelised sugar before laying out the apples. The photos were very useful for checking that I was doing the right thing. Many thanks for a great little recipe!! I must say I use different apples depending on what I have at hand. It looks like Jonagold works well and 'Granny Smith' (green crunchy) does too (gives more sourness to the tart). Regarding the butter, you could cook the caramel with the butter stirred in. Melt the butter in a pan, then sprinkle the sugar over it. Cook on medium-high heat till you see the sugar melting and starting to caramelize. Then stir it gently to get all the sugar melted and pour the caramel into the baking dish. Stirring the butter into the hot caramel might turn problematic (it gets chunky, bubbles like crazy etc). Hope you will enjoy your further experiments a lot!